* Instantly fix rips and tears on down jackets on the go with Tenacious Tape Mini Patches. Apply it on puffy coats or sleeping bags to quickly stop feathers from leaking or use one to fix a ripped GORE-TEX® jacket or torn tent. 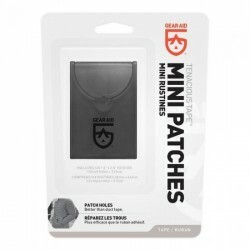 The mini patches come in a lightweight and convenient pocket pack and includes six ready-to-use patches in clear and black nylon. With no cutting required, simply peel and stick for quick, on-the-go repairs. Throw some Tenacious Tape Mini Patches in a backpack or pocket and never worry about ripped gear again.